Periscope and Meerkat are old hat. Yes, already. The new kid on the block is Blab.im – real-time live streaming video conversations for up to four people at a time. The audience watches, can comment within the Blab and on Twitter, and can switch places with the original chatters. How should brands be thinking about Blab? Is it just a flash in the pan? Or a sea change in communication? Read on. Blab’s new, easy, fun, free, completely interactive and on 24/7. Its creators drop into Blabs all the time (they don’t seem to sleep) and they update features in real time. Unlike podcasting or other forms of live streaming, which are essentially one to many broadcasts, Blab participants can see, hear and chat with each other in real time, while simultaneously Tweeting about the Blab. And, oh yes, the immediacy of Blab is addicting. Right now, average time being spent on Blabs, according to its CEO, Shaan Puri, is 64 minutes. That is mind-boggling given our short and fractured attention span, which is said to lag behind that of a goldfish. When you get into a Blab, there’s so much going on that you only realize later that you just gave up two hours of your life, and/or that it’s 1 a.m. Among those who drop into Blabs are Spencer Pratt & Heidi Montag from the Hills, Al Jazeera, T-Mobile CEO John Legere, and people from all walks of life who sometimes end up getting on airplanes to meet in real life. There’s already a Blabaholics group on Facebook, and a Blab Rehab Show for the platform’s addicts. It’s a Blab, natch. That’s because Blabs start with the intention of lasting 30 minutes and end up streaming for hours on end. Sometimes, the host leaves and participants start a new blab where the conversation continues. And here’s a collection of Tweets from fans who love Blab. Concerts – two songwriters met in a Blab, composed a song together in real-time, recorded it and have performed it live several times since. Blab is not a substitute for Hangouts on Air, Crowdcast, GoToMeeting, or Skype. It will not offer private or paid meetings, says Puri, and it doesn’t want to compete with existing platforms. Each of those platforms has its own advantages and shortcomings. Blab, says Puri, does not want to duplicate features of other platforms. Hangouts, for instance, are integrated with YouTube and all other Google products. So screen sharing and other collaborative features are enabled for public, private, free or paid sessions. But Hangouts has a steep learning curve for those who want professional results and many people find that daunting. 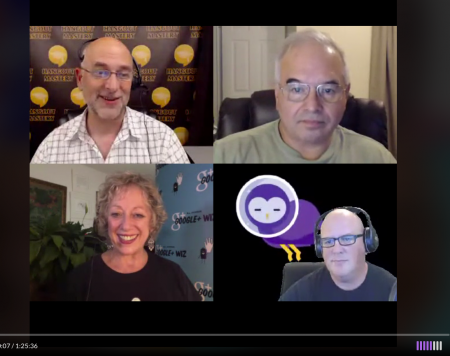 Here’s a screenshot from a Blab hosted by Ronnie Bincer, with me, Chef Dennis Litley and Michael Thomas discussing the role of video in building trust and marketing. You can watch the replay here. Blab, which is free, is spectacularly simple to use, has features you won’t find on other platforms (yet) and is a very quick way to reach and engage with a vast new audience worldwide. The key to Blab’s instant popularity is that it is essentially plug and play. It works on both desktop and mobile devices, and the two integrate seamlessly. And it is being constantly updated, in real time, by Team Blab, 12 people who work out an office in San Francisco. Here’s their step-by-step guide to Blabbing. As a host, you get to accept callers into the Blab, and kick them out as well. You cannot control who partcipates in the comments, yet, but you can report spammers and trolls. The host will get the downloadable MP4, MP3, and embed code once the recorded Blab has ended. The MP4 can be edited, branded and uploaded to YouTube, Vimeo, a website, etc. Still in Beta, after a soft launch in April, Blab evolves daily. Puri (@ShaanVP), Brittany Metz @BrittanyMetz, Community Manager, and CTO Furqan Rydhan @FurqanR frequently join Blabs and hold Town Meetings to ask what features we’d like them to add. And then, astoundingly, they add them! PitchCrafts are also held regularly so startups can pitch prominent VCs. One of Blab’s more valuable offerings is the ability to Start a Live Blab session from Mobile devices and have all the same features that are available on desktop. No other streaming platform offers that option. Unlike any other platform, the host an even pause the recording and go “off the record” and it’ll be cut from the final recording! The host also has the ability to change the topic mid-Blab. Recordings can be up to 6 hours long. Who’s the money behind Blab? Blab has a bit of a complicated heritage. It was incubated at Monkey Inferno, a San Francisco-based incubator which has since been dissolved. Blab’s co-founder and main investor is Michael Birch, who created Bebo, a messaging app that was sold to AOL in 2008 for $850 million. Birch bought Bebo back in 2013 for $1 billion and created Monkey Inferno with the same team that built Bebo, including CEO Shaan Puri. Blab spun off as its own company in January 2015, with Birch as its main investor and Puri as CEO. “That kind of financial security means we’re a fast-paced but low-stress workplace,” says Puri. “When we saw the way Blab was taking off, and saw the potential of the project, we doubled down to focus entirely on Blab,” he explained. The Beta of Blab launched in April. None, so far. The goal, says Puri, is to build the audience to the point where it becomes possible to make money. Brands, he says, are usually late to the party. When they see that you have people’s attention, they take a close look. Smart brands should take a look right now because the average active user is currently spending 64 minutes a day on Blab – making it a close competitor to TV and Netflix. There is, without a doubt, a bit of mania on the platform. But many think that frenzy is just beginning. More quantity than quality right now? “We just make the tool,” Puri says. “The people make the products.” Creating something people will actually want to watch is another thing entirely. I’m enjoying the frenzy, but already bored by the hours-long talk fests that have no beginning, middle and end – often by people who should know better. What about monitoring and analytics? Social relationship monitoring companies like Brandwatch, Hubspot, Sprinklr et al need to start monitoring Blab and creating metrics for brands. And Blab needs to start providing stats and analytics, which are said to be in the works. And around Blab, in the works could be 15 minutes from now. What about Twitter and Blab? In the past, Twitter has blocked platforms that used their name, their API. Given that the only way to sign in to Blab is through Twitter, this could present a future danger. But Blab is bringing new users to Twitter on a daily basis. That should be appealing to investors since audience growth has been one of Twitter’s core issues. What’s the Bottom Line on Blab? In the end effect, Blab’s eventual success is going to be about good guests, good topics and shorter segments. And those are the very things that create opportunities for brands. Now is the time for brands to take a close look at Blab and jump in to learn more.